Home / Alumni News / The Films: The Final Chapter / Jason Voorhees Actor Ted White Interviewed This Thursday! Jason Voorhees Actor Ted White Interviewed This Thursday! Ted White is heralded as one of the best actors/stuntmen to portray Jason Voorhees in the film franchise. Ted created a menacing Jason that viciously dispatched of his victims with no restraint whatsoever and fans appreciate that aggression in the character. It's a pleasure to hear the former John Wayne double tell his stories about Hollywood prior to his time in Crystal Lake and after, which is why we were excited to get the news of a new interview with the Jason Voorhees actor. 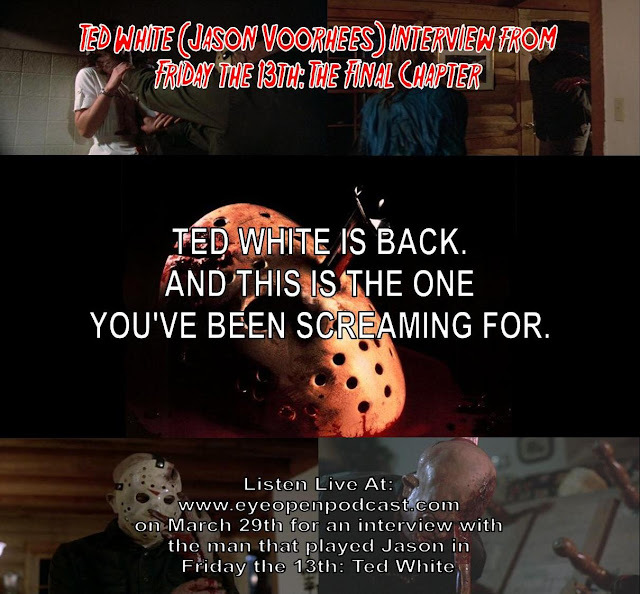 Ted will be appearing on the Eye Open Podcast this Thursday March 29th at 10PM Eastern time and we are sure there will be some great questions asked about Friday The 13th: The Final Chapter. Thanks goes out to Chad Foltz, one of the hosts for the show, for letting us know about the interview and we wish his crew good luck. Make sure to tune in and listen to what a true Hollywood legend has to say about his career and Friday The 13th!